Many people say Matahri Beach and Sanur Beach possess the best sunrise view in the world. 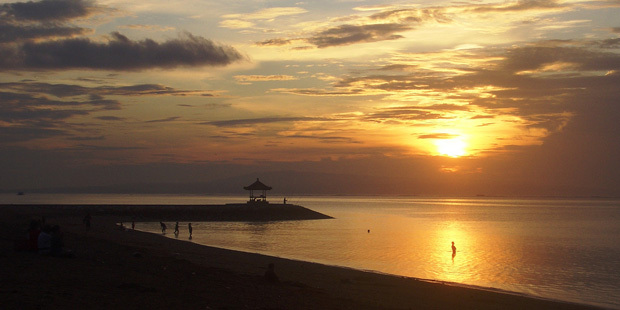 Enjoy the nightlife in Sanur and lay down on the beach to experience the most wonderful sunrise sight in the world. Sanur provides delicious food to the surfers from the restaurants, cafes and stalls. Many beachfront restaurants provide the beautiful view and delicious food to make your meal special. Art galleries, shopping plazas and cultural attractions are present in huge number in Sanur. Playing jukung sailing, canoe and other water sports is fun at Sanur beach. For the convenience of the surfers, transportation system in Sanur has been kept swift and versatile. Busses and taxis are easily available in Sanur. You can also rent a motorbike or a car in order to explore Sanur, Bali. Sanur is near to some of the sightseeing spots. It has become the main reason for surfers to choose Sanur as their holiday destination. Sanur has an interesting history. Netherlands invaded Indonesia by entering Sanur. The war between Netherlands and people of Sanur took place in 1906. Many wars occurred between these two nations in Bali. Sanur possesses budget and luxury hotels/villas. You may choose the one that suits you. The private villas in Sanur are modernly designed. The villas in Sanur have carved pillars along Alang-Alang thatched roof. These villas have enough space for large group of people to be accommodated. You may throw a Barbeque party to enjoy yourself in Sanur. No matter from which part of the world you belong you can enjoy your country food in Sanur, Bali. French, Japanese, Chinese, Italian and all kinds of sea food is available at the restaurants on Danau Poso Street, Pantai Sindhu Street and Danau Tamblingan Street. Stalls in the night market on the streets provide the tastiest local food. It is worth eating from one of these stalls. You can get all kinds of fast food from the restaurants in Sanur. Shopping in Sanur is less expensive as compared to other areas of Bali. You can find everything from the Sanur Beach Market. You can buy sarongs, towels and t shirts at half the price of what you pay at any boutique. Originally, Sanur was a sleepy fish village. However, the place got developed gradually as people decided to explore more of the Indonesia. Pack your bags and book a private villa in Sanur to enjoy the heavenly vacation in Indonesia.